Celia Houghton married Dr. Aaron W. Jenkins, son of William F. Jenkins and Lucy A. Houghton, in Aug 14, 1865. John N. Barbour married Electia T. Houghton, daughter of Hiram Houghton and Aurilla Barrett, in Aug 15, 1850. Mary Elizabeth Keith married Brigadier General Moses Barrett Houghton, son of Hiram Houghton and Aurilla Barrett, in Nov 8, 1854. Webster Young married Mary E. Houghton, daughter of Hiram Houghton and Aurilla Barrett, in 1855. Spenser Dyer married Harriett Houghton, daughter of Hiram Houghton and Aurilla Barrett, in Mar 12, 1865. 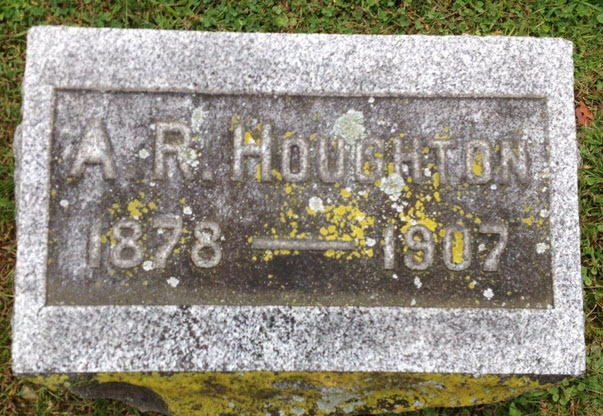 Frederick William Houghton married Ellen Hall in Oct 26, 1888 at Lansing, Ingham Co., MI, USA. Allison Royal Houghton married Mable Dyer in Aug 23, 1899 mar 1/12 years in 1900 census. Ellen Hall married Frederick William Houghton, son of Dr. Warren F. Houghton M.D. and Emma Jenkins, in Oct 26, 1888 at Lansing, Ingham Co., MI, USA. Mable Dyer married Allison Royal Houghton, son of Dr. Warren F. Houghton M.D. and Emma Jenkins, in Aug 23, 1899 mar 1/12 years in 1900 census. Merriam Fairbank married Torrey Houghton, son of Manassah Houghton and Eunice Kendall, in Apr 6, 1837 at Sterling, Worcester Co., MA, USA. Burial Chocksett Burial Ground Cemetery, Sterling, Worcester Co., MA, USA, w/o Eli Section G.
Mary Anne Kilburn married Eli Houghton, son of Manassah Houghton and Eunice Kendall, in Mar 26, 1832 at Sterling, Worcester Co., MA, USA. Death Dec 27, 1843 Leominster, Worcester Co., MA, USA, single, a. 25. inflamation of bowels. Death Feb 3, 1835 Worcester, Worcester Co., MA, USA, ae. 23 yrs. Moses Houghton married Annah Taylor in 1816 at Stow, Middlesex Co., MA, USA. Annah Taylor married Moses Houghton in 1816 at Stow, Middlesex Co., MA, USA. Jonas T. Houghton married Lucinda H. Ross w/1. Jonas T. Houghton married Mary J. (?) in circa 1867 mar 33 years in 1900 census. Lucinda H. Ross married Jonas T. Houghton, son of Moses Houghton and Annah Taylor, w/1. 1880 Census 1880 Hudson, Middlesex Co., MA, USA, age 52, express proprietor; near son Charles W.
Willard Houghton married Jane Wilkins in May 28, 1849 at Marlborough, Middlesex Co., MA, USA. Willard Houghton married Ella M. Walker in circa 1868 mar 32 years in 1900 census. Jane Wilkins married Willard Houghton, son of Moses Houghton and Annah Taylor, in May 28, 1849 at Marlborough, Middlesex Co., MA, USA. Lilla Bessie Houghton married Albert Curtis Marble in Mar 26, 1891 at Worcester, Worcester Co., MA, USA. George Houghton married Sophia Morse in Jun 10, 1845. George Houghton married Clarinda Miller in Apr 10, 1858 w/2. Sophia Morse married George Houghton, son of Elisha Southwick and Lydia Houghton, in Jun 10, 1845.